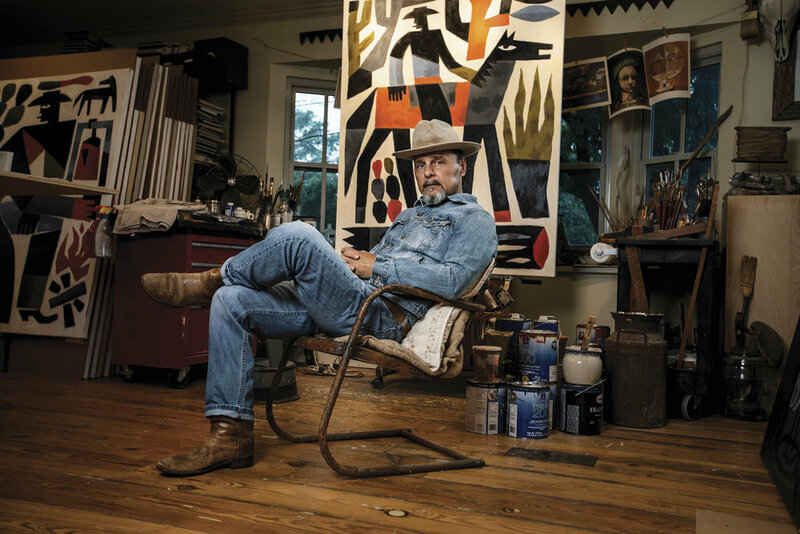 Texas artist Jon Flaming is, much like the Lone Star State itself, vast—in interests and richness, in talent and good talk. His studio speaks to a background that is equally diverse. On one side, a large computer cues Flaming’s success as a graphic designer whose Dallas-based firm represented a number of Fortune 500 companies and mom and pops alike; and on the other, an easel tells of his turn into full-time fine art, a move he made three years ago, but indeed much earlier. At just 5 years old, Flaming remembers sitting in Sunday school, engrossed by an older boy’s sketch of a jet airplane—a small but seminal moment he credits for helping pave his artistic path, which starts from rural Kansas and leads to big-city Dallas, where as a typical Texas boy, he grew up watching cowboy shows, attending church and playing football. But, as the son of musicians, he also played music, made art and considered a career in architecture. Flaming eventually settled on graphic design, and pursued it while at the same time building equity in the art world. He secured the representation of a Dallas art gallery, had pieces in three Texas museums, and created a following for his depictions of rootsy, workingman western culture—dance halls, oil rigs, and ranches. “My earliest memories are of rural, middle America,” says Flaming, referencing his grandparents’ Kansas cattle ranch and his many visits there. “It was such a sweet time for me; I have great memories of seeing a working ranch, the farm equipment, the cattle, and the images of a small-town farming community and everything that goes along with that. So when I could drive, I wanted to get out and see everything in Texas that was related to what my memories were as a kid. All of it appeals to me.” And to his audience, which includes private and corporate collectors; this group will likely broaden with Flaming’s latest series, Modern Cowboy. We partnered with Jon to develop a very creative and art-driven apparel collection that brings his unique vision to life. Click the button below to explore the collection!